While some 300 million people in India continue to live on less than a single dollar a day, the country's growing prosperity in business ventures has also created considerable wealth for some. This CNBC Original program provides viewers with engaging insights into India's economic rise to power along with the country's rich cultural heritage. Viewers can expect to gain a deeper understanding of the forces that have contributed to India's success as well as what obstacles and challenges India may continue to face going forward. Learn more about India's culture, business practices, consumer habits and caste system in this exciting, in-depth 44 minute report. Although some 300 million people in India continue to live on less than a single dollar a day, the country has managed to position itself as an economic powerhouse that has created a number of billionaires across the country. 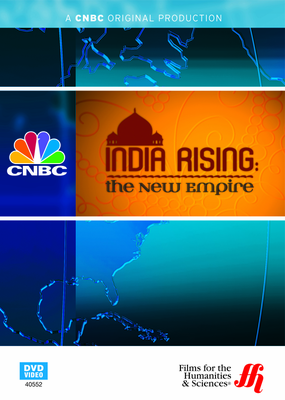 This powerful CNBC Original program examines in detail the success of India's outstanding business growth along with current issues regarding rural poverty, the country's caste system and a wide variety of economic topics. Call centers, consumer habits and India's wealth gap are also explored in fascinating detail. This program features interviews with some of the biggest names in India's economic revolution such as managing director of Tata Motors Ravi Kant, managing director of India's National Stock Exchange Palaniappan Chidambaram and Ravi Narain, India's finance minister. Nobel Peace Prize laureate Muhammad Yunus also provides his insightful thoughts on his country's rise. Learn more about India's exciting business boom in this program that takes a close look at India's successes, ongoing challenges and its new role on the world stage of an ever evolving global marketplace.